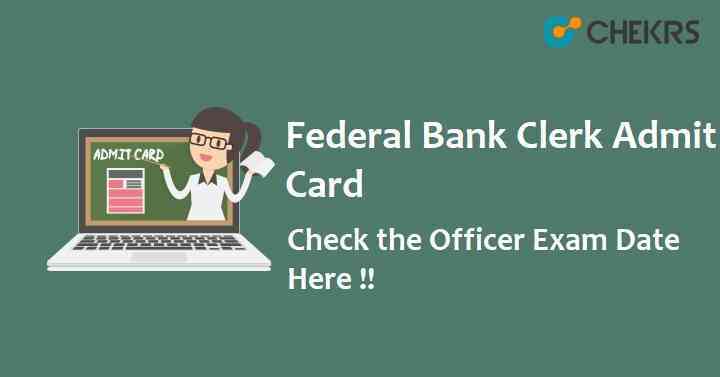 Federal Bank Clerk Admit Card 2018: The Federal Bank authorities will conduct the online written examination on 9-09-2018 as per the schedule. As you all know that the exam is being conducted for the recruitment of the deserving candidates on the vacant posts of Clerk and Officer Scale I. The Federal Bank Officer Admit Card has been uploaded on the bank’s website. You can also get your Federal Bank Clerk Admit Card 2018 from the direct links provided on our page. The candidate is required to use Registration Number, Password/Date of Birth for downloading the Federal Bank Clerk Call Letter. Follow the guidelines given below and get your admit card easily to appear in the exam for Banking Jobs. Visit the ‘Career’ option available on the home page of the official website. Then, click on the link Federal Bank Exam Admit Card 2018 available there. Now, login yourself with the registered id and password. Collect the admit card and keep its printout. The exam date has been finalized by the recruiting authorities for the forthcoming competitive examination. Check out the table specified below and we will inform you in case of any change in the Federal Bank Officer Exam Date. Candidates will have to visit the careers page of Bank’s official website for downloading call letters for online aptitude test. Intimation for downloading Federal Bank Hall Ticket will also be sent through email/SMS. Candidate needs to affix recent recognizable photograph on the call letter preferably the same as provided during registration and appear at the online aptitude test center with Call Letter, Photo Identity Proof and photocopy of the same. Remarks: Leave your doubts and queries related to the Federal Bank Clerk Admit Card 2018 in the comment box and we will provide you the suitable answers.